An industrial Surry Hills warehouse hosted the first ever 'Flash Party' last Thursday with 150 industry guests invited to sample the very finest in event catering and experience a unique alternative to the now common pop-up bar. An industrial Surry Hills warehouse hosted the first ever ‘Flash Party’ last Thursday (Oct 14) , with 150 industry guests invited to sample the very finest in event catering and experience a unique alternative to the now common pop-up bar. Earning its name by appearing in a flash and disappearing in a flash, the ‘Flash Party’ concept is the brainchild of MONDO Bartenders, created to showcase event styling, fine catering, beverage solutions and entertainment at its best. The “Flash Party” was launched with a retro and urban inspired soiree held at Roller studio in Surry Hills, with the top-secret location being revealed to guests via email and sms just 24 hours prior to the event. With a retro scooter marking the entrance, the raw warehouse space was filled with eclectic recycled décor, digital projections displayed on walls throughout, two specialist cocktail bars, and a mini seated diner. Former Home & Away actress-turned-solo artist, Sally Marett proved popular with guests by performing a series of jazz and soul tunes. Over four hours, guests experienced a multitude of cocktail creations presented by leading Mondo mixologists. Popular choices included the Gingerbread Martini (Bacardi Oro, cloudy apple and a dash of ginger and egg white), The Roller (tequila, fresh blood orange juice, lime, berry, almond, served in a mini milk bottle with straw), and Nothin’ But A Good Time (Whisky & Tuaca, berry, lemon, lemonade, served in a poison bottle, finished with dry ice for a bubbling poison effect) which was inspired by 80s rock band Poison and their hit song. Chef Justin Bull of Bayleaf Catering provided an abundance of fine food featuring locally sourced ingredients. His popular specialties included Alaskan king crab crostini, spring lamb racks, quail saltimbocca, and tempura zucchini flowers with lemon, ricotta and oregano. 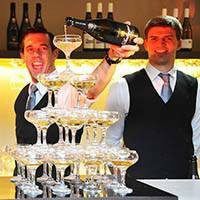 Mondo Bartenders have been providing a range of event services and beverage concepts throughout Australia for the past 12 years. Renowned event and catering expert and founder of Bayleaf Catering, Chris Stubbs recently acquired Mondo and has since introduced the company to a wider audience thanks to having spent time touring with the likes of AC/DC, Elton John, U2, Florence and the Machine, Slash, Dizzy Rascal, Whitney Houston, and Lady Gaga, to name a few.